Why are terrain regions shared between terrain types? How do I get the effect I am going for? Do I have to duplicate tiles to make sure there are no competing terrain regions? You’ve neglected to mark your horizontal and vertical transition tiles with both terrains. 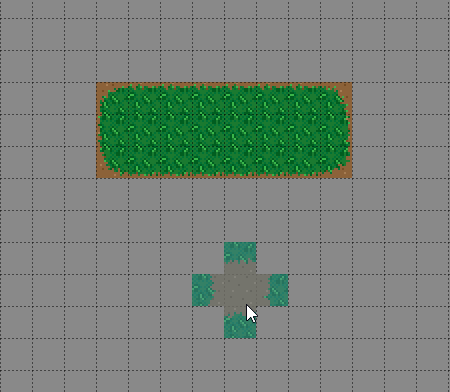 You’re trying to draw grass/dirt on an empty field, so the terrain engine is trying to find tiles that transition from your terrain to [empty], and the only transitions it can find are the ones where you didn’t mark the other terrain and left it empty. You should finish marking the tiles with both terrains, and then Tiled should behave as you expect. If it doesn’t, then bucket-filling the layer with grass or dirt and then drawing the other terrain on top of that will work. My tileset is in a bit of a bad state at the moment, so I can’t test the other suggestion you have (but I will do that when I have a chance and report back). You misunderstood my post. You have the tiles you need, but you didn’t finish marking them. Your side tiles are marked with one terrain each, instead of being marked with both grass and dirt.